Matthias Maute has achieved an international reputation as conductor, recorder and flute player and as a composer. Mr. Maute is esteemed for his artistic direction of Ensemble Caprice, for whom he produces ingenious and fascinating programs. With this ensemble he regularly appears at major festivals world wide. In Canada he has performed at the Ottawa Chamber Music Festival, Festival international du Domaine Forget and Elora Festival among others. In the realm of choir and orchestra direction Matthias Maute has focussed more and more on large scale projects. His versions of Bach’s B Minor Mass, Arvo Pärt's and J.S.Bach’s Magnificat and J. D. Zelenka’sMiserere were broadcast nationwide by CBC Radio 2 and Radio Canada/Espace Musique. He has recorded G. F. Haendel’s Music for the Royal Fireworks on CD, and under his direction Ensemble Caprice was awarded the prestigious 2009 JUNO Award for Best Classical Album of the Year (Vocal or Choral Performance) for its CD Gloria! Vivaldi’s Angels on the Analekta label. In September 2012 Ensemble Caprice directed by Matthias Maute will release a double CD on Analekta featuring Bach’s Brandenburg Concertosjuxtaposed with Preludes from Shostakovich's Op. 87. His solo career has soared since winning First Prize in the soloist category at the renowned Early Music Competition in Bruges, Belgium in 1990. He made his debut at Lincoln Center in New York in December 2008. In 2003 and 2005, he was the featured recorder soloist at the Boston Early Music Festival. 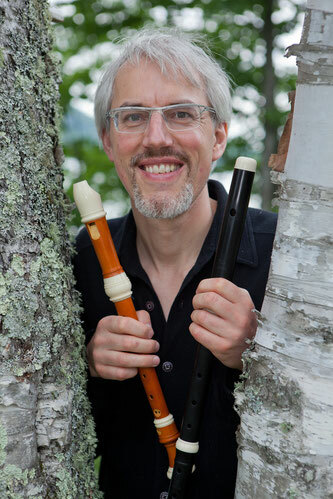 Matthias Maute’s compositions hold an important place in the world of contemporary recorder music and are published by Breitkopf & Härtel, Amadeus, Moeck and Carus. Mr. Maute has made some twenty recordings on the Analekta, Vanguard Classics, Bella Musica, Dorian, Bridge and Atma Classique labels. He teaches at Université de Montréal and McGill University in Montreal. Historic Leith Church, Meaford, Ontario 8 p.m.
Harmony Centre, Owen Sound, Ontario 10 a.m.